As a divorce attorney in Orange County California I am here to tell you that divorcing in California does not have to be a complicated process, but it does mean that you and your spouse or partner will need to make some decisions about the way your life will change. One of the best ways to get advice about these decisions and to understand exactly what options are available to you is to discuss your situation with a qualified divorce attorney in Southern California. Prior to meeting with an attorney, it might make you feel more comfortable to do a little research online so that you have a basic background in the options that you have under California law. Your lawyer will help you understand how the legal options that the law provides can be applied to your case. When it comes to ending a marriage in California, most people will think of divorce first. However, there are other ways to separate from your spouse or partner. Unlike divorce, a legal separation leaves two spouses still legally married so that they are not free to marry another person. However, in many other aspects, a legal separation is similar to a divorce. It usually results in the two parties living separately, dividing their property between them, one spouse or partner paying support to the other, and if children are involved, child custody and child support orders will also be determined. There are many reasons why a couple might choose a legal separation over a divorce. Some may avoid divorce for religious reasons. Others choose to legally separate because they are not eligible for a divorce in California due to the residency restrictions. Some couples may simply not be ready to finalize a divorce yet, so they opt for a legal separation instead. 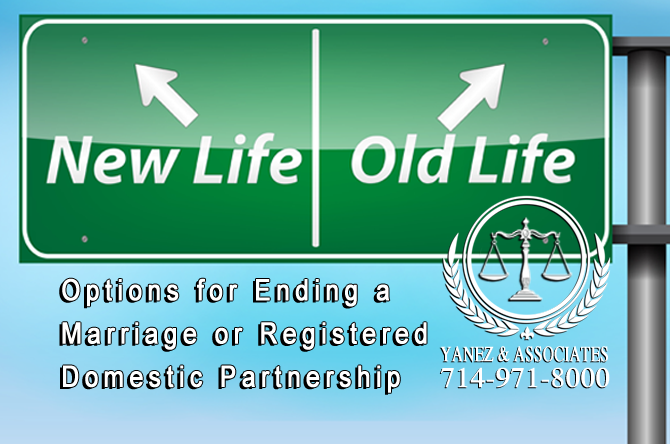 An annulment is another way to end a marriage. Unlike a divorce, which ends a marriage, an annulment renders the entire marriage invalid, as if it had never existed at all. There are only certain circumstances in which a couple can qualify for an annulment. Usually, annulments happen relatively quickly after the beginning of the marriage. To qualify for an annulment, one party needs to prove that at least one of the following is true. • One party was physically incapacitated, or unable to consummate the marriage, and the physical incapacitation is incurable. Even though a divorce is more common than either an annulment or legal separation, it is always worth considering how you want to end your marriage. If you do opt for a divorce, you may still have several other decisions to make regarding how you want to go about your divorce. What Does A California Divorce Entail? The first thing you’ll need to determine in your divorce is whether you are eligible for a summary dissolution or not. A summary dissolution will give you a divorce, but the process is much simpler, faster, and in most cases, less expensive than divorcing any other way. However, a summary dissolution is not for everyone! Only couples that have been married for less than five years, have no children, and have limited property, debt, and money will qualify. It also means that neither spouse is ever allowed to request spousal support from the other. If the trade off sounds like a good option for your situation, discuss a summary dissolution with your attorney in your initial consultation for a professional legal opinion. With the exception of a summary dissolution, most divorces take a lot of work and decision-making. Finding a quality divorce lawyer in your area can make these decisions infinitely easier to make. Your lawyer is likely to understand the law and be able to explain it to you in a way that allows you to make intelligent and informed decisions. • Other factors may need to be determined depending on the specifics of your divorce. The details of the answers to these questions will make up the terms of your divorce agreement. However, no two divorce agreements are exactly alike, because no two families or divorces are exactly alike. Answering these questions requires either you and your spouse to agree on how you want your divorce end up, or for you to go through a litigated divorce. To an extent, this is up to you, but only if your spouse is willing to work with you. 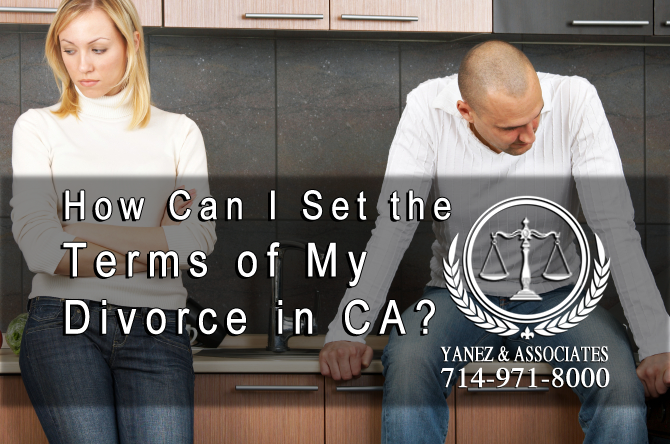 How Can I Set the Terms of My Divorce in California? Learn How Can I Set the Terms of YOUR Divorce in OC California? Depending on your relationship with your spouse or partner as your divorce approaches, you may choose to set the terms of your divorce in one of several ways, or even in a combination of ways. If you are on good terms, and you wish to discuss the terms of your divorce outside of court, you have that option. Remember that anything you agree to will need to be approved by a judge before it will be signed into a court order. If you are looking for a little more guidance than a simple conversation with your spouse or partner, consider a form of alternative dispute resolution. Mediation and collaborative law both offer options for supervised and guided discussions with the help of a professional, and they allow you to make your own decisions about your divorce instead of leaving these decisions up to a judge. Mediation allows you and your spouse or partner to sit down with a trained mediator, who acts as a neutral third party. 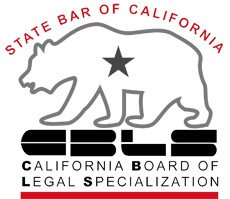 The mediator may have a legal background or a psychology background, because a lot of divorce mediators in California are actually retired lawyers, therapists, or judges. The mediator has received special training, and has learned how to facilitate productive conversations between couples that may not have the best idea on how to work through their divorce. While neither party is allowed to have a lawyer present during mediation, it is advised that both parties at least consult an attorney prior to signing any agreement that is created during mediation. Similarly, collaborative law, or collaborative divorce, allows both parties to discuss their issues in a guided situation outside of the courtroom. Collaborative law allows both parties to meet outside of the courtroom, and both parties can bring their attorney. With the advice of their attorneys, the parties can discuss the decisions that need to be made and work towards a solution. Following either divorce mediation or collaborative law, the parties and their attorneys or their mediator will need to draw up a divorce agreement, both parties will need to sign, and submit to the judge for approval. If approved, the agreement the spouses made can be signed into the divorce agreement. Sometimes, a couple is able to work through some issues outside of the courtroom, but not all of them. It is possible to set some of the terms of your divorce agreement on your own, outside of the courtroom, and leave some of them up to the judge. Sometimes it is necessary to leave everything up to a judge. Unfortunately, a judge does not know you or your spouse, and he or she does not have as much time to get to know you as an attorney does. If your divorce will be settled in court, it is a great idea to have a quality divorce lawyer on your side. Your lawyer should take the time to get to know you and understand what you want from your divorce, and he or she should be able to present your case to the judge in a way that lets the judge know both what you want, and why it should be granted. We are located in the heart of Orange County, 2 blocks from the family law courthouse, call today for a free case review! Having a quality lawyer on your side can make a world of difference in a divorce in California. Although it requires you to make a lot of decisions that will have a huge effect on your life as it changes, finding a lawyer who will work with you, understand your wants and needs, and help you understand how the law can work in your favor can lead to positive results. If you are ready to discuss your upcoming divorce with an attorney in Southern California, contact the attorneys at Yanez & Associates today. We offer free initial consultations, and we are here to help you through this transitional time. 3 What Does A California Divorce Entail? 4 How Can I Set the Terms of My Divorce in California?